Puddledog Productions Official Launch & Live Demonstration! 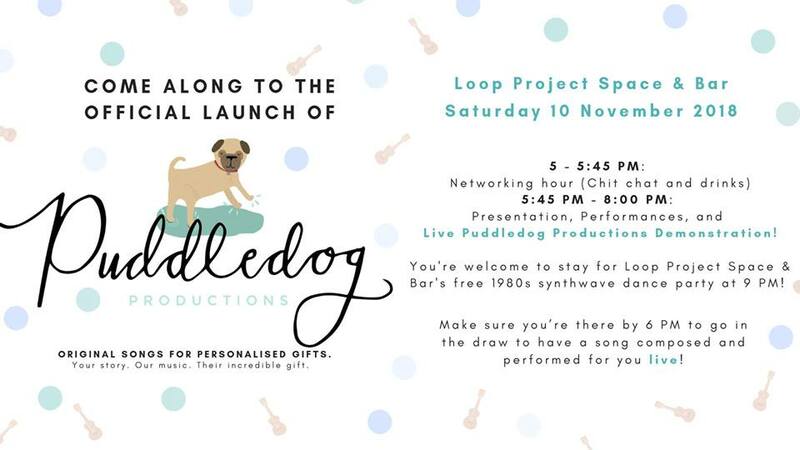 We are SO excited to invite you the official launch of Pudldedog Productions on Saturday 10 November 5:00 PM, at Loop Project Space & Bar! Entry is free! The night will be a celebration of the business, an explanation of what we do and why we do it, and MOST excitingly, a live demonstration of the Puddledog Production process, as four lucky members of the crowd will have songs composed and written that same night for FREE! 5:45 – 6:00 PM: Puddledog Speech; What we do, how to do it, why we do it. 7:15 PM – 8:00 PM Puddledog Productions Live Demonstration/Competition winner reveal! We have been told that we have to wrap up by 8:00 – 8:15 so that they can set up the space for a 1980s synth party, which is open to the public!